Xylella is here and it could be dangerous Will Italy start to take the threat of this new disease seriously? Climate change and global trade combine to make it ever more likely that new pests and diseases will threaten food supplies. A classic example is playing out now in Puglia, the region that includes the heel of Italy’s boot. The disease is caused by a bacterium — Xylella fastidiosa — that clogs the xylem vessels that carry water up from the roots. No water means leaves shrivel and scorch and eventually the host plant can die. 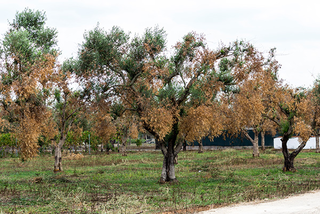 In 2013, Xylella was found for the first time in Europe, in olive trees near Gallipoli. Plant health plans swung into action, to try and eradicate, or at least contain, the disease. And so did politicians and activists, blocking progress with ignorance, half-truths and manipulation. In consequence, the disease has now spread to cover the whole of the Salento peninsula. In the view of people much more expert than I, there may now be no stopping Xylella. Rodrigo Almeida, of the University of California, published an article in Science last week, asking Can Apulia’s olive trees be saved? As he is an expert, I see no reason to present a different point of view, so you may find the podcast one sided. So be it. Rodrigo Almeida’s article is behind a paywall, but if you want a copy, I’m sure I can help you find one. Thomas Simpson is keeping a website that offers quick and helpful translations of articles about Xylella. It is a great resource if you want to know more about the foolishness. While I have your attention, let’s hear it for expertise. Eden reposted this on twitter.com. Agroecología reposted this on twitter.com. Chris Aldrich liked this on twitter.com.